Always be listening to attendee feedback so you can make instant changes where possible and create the best event experience. Mobile event apps have a variety of ways for the event organizers and planners to collect feedback from attendees on-the-go. This can range from instant feedback at the event to session-specific feedback after they’ve attended the event. Below is a breakdown of the type of pages you can use for collecting event feedback and the variety of ways we’ve seen them used. Add a poll page to your mobile app in the Yapp Editor. Type or paste in the question you’d like to ask your mobile users. Type or paste in as many answer choices as you’d like for the question. Publish this and other changes to the app and your poll will be available in the app instantly. Send a push notification to motivate mobile users to participate in the poll. Once they submit a response, they’ll see a percentage tally on the results page. Remember: You can add and remove as many polls as you’d like. If you’re ready to delete a poll but want to save the responses, just head over to your dashboard and export the responses or you can see a pie chart of the responses in your app analytics. Pro tip: Depending on your app’s privacy settings, you’ll also be able to export responses to the poll with names and email addresses for all respondents. If you’re have your event app ready and in the hands of your prospective/registered attendees, you can leverage polls to collect ideas and input from them. Some fun ideas: Have them vote on the tagline for the event. Or, choose the flavor of the pie at the keynote session. If you’re trying to get rid of paper at events, have submit a request for print agendas with a poll! Here is a tip directly from our Event App Marketing Guide: Post competitive and fun polls into the mobile event app. As responses come in, take a screenshot and use that to draw installs. Who doesn’t want to get in on some competitive voting action? Do you have an award night, a competition or perhaps there is a vote for finalizing an agenda item? A poll in the app is the best place to collect these votes. Plus, these types of polls are perfect for incentivizing downloads! Want quick feedback from attendees during the event, maybe even during a specific session? Add in a Poll page with the question and have the moderator or speaker announce it during their session. Again, a great way to increase event app downloads! As your event is wrapping up, add in a new Poll page with a question about the event, publish the app and notify the attendees. Get feedback about the event before attendees even leave the event so you can be sure to get the highest response rate, feedback while it’s fresh on their minds and start working on ways to improve the next event right away! Yes, that’s right. You can leverage the Poll page to ask a question that’s been submitted by your Sponsor. They’ll get coverage in the app, interaction with the attendees and valuable data. Turn on this feature via the Yapp Editor. Let mobile users know via a push notification that they can now leave feedback for each item on the schedule page (don’t forget to remind them the day of the event). Users can leave feedback with a five-star rating option as well as a comments option for open-ended feedback. Forget about creating and circulating lengthy, confusing surveys (or event worse, distributing, collecting and tabulating paper feedback forms)! When you’re ready, export the data from Analytics. If you have a more complicated survey or feedback form that needs to be filled out, you can use our Simple Text or Image & Text page templates. Add in the page, rename it “Survey” or something similar, and add in the information including the link out to the questionnaire. Though, our advice would be to leverage the other in-app features to collect feedback throughout the event to avoid overwhelming attendees with lengthy forms and surveys. If you’re looking for open-ended feedback, you can post questions in the News Feed. This can be in the News Feed amongst other chatter going on or you can dedicate a News Feed page titled “Feedback” specifically for people to share their thoughts with you. This is a fantastic way to encourage candid posts from attendees throughout the event for anything from logistical items such as “The temperature in the room needs to be adjusted” to session-specific feedback such as “The keynote was fantastic but wish we had more time to network after”. You’ve worked hard to get the best event app and leveraged it in many exciting ways to engage your attendees. Now you want to know if it was all worth it? For feedback on your event app performance, look at the mobile app analytics. Monitor how your attendees are engaging with the app such as most popular pages. 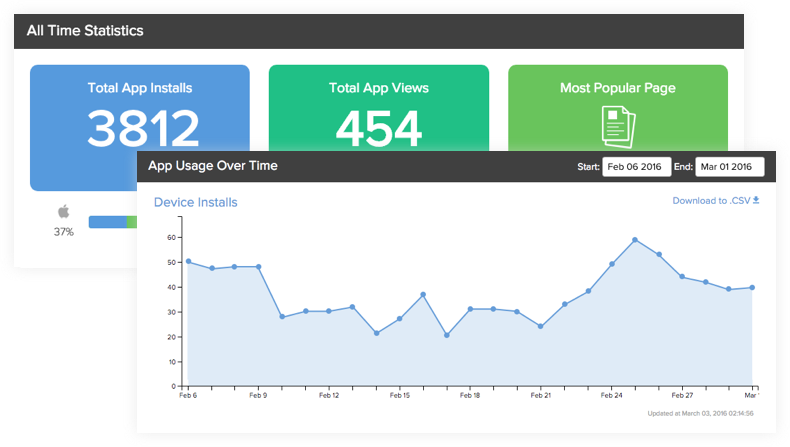 With Yapp, from the moment you create an app you can access the analytics dashboard for your mobile app with real-time insights. Monitor all of your mobile app analytics for events such as app installs, app adoption and app usage over time as well as dive into content specific metrics. Are there other ways that you have used a Yapp event app to collect feedback from your attendees? Share with us below!